Founded in 1999, the Washington Brewers Guild is an awesome community of craft brewers fighting to protect the interests of WA breweries and ensure choice for WA beer lovers. In addition to our brewery memberships, we offer allied and associate memberships to businesses offering products and services geared to brewers. 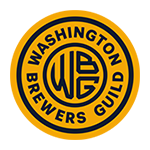 The Washington Brewers Guild is funded through membership dues and our two annual fundraising festivals, Cask Beer Festival and Winter Beer Fest.